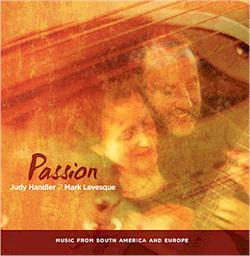 Husband and wife duo, Judy Handler and Mark Levesque blend Brazilian, Latin American, swing, gypsy, classical and folk music influences to create their sophisticated and expressive arrangements. Audiences respond with great enthusiasm to their extraordinary sound and the uplifting spirit of their music. They have performed over 1,200 concerts together throughout the Northeast and Midwest.